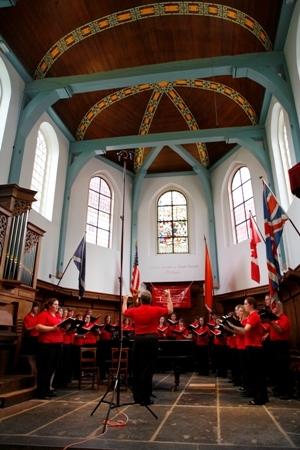 Over the past 20 years, the UNO School of Music has completed 19 international music tours of its various performing ensembles which have covered over twenty countries in Asia, Europe and North America. 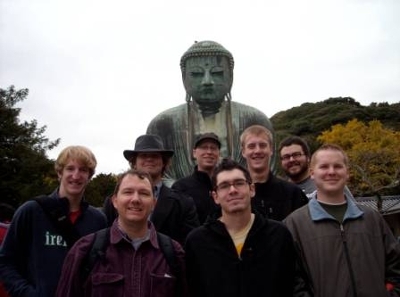 During this time a vast majority of the students with music degrees from UNO have had the opportunity to experience at least one international touring experience. These tours have not only provided students with the chance to travel to new places throughout the world, but also have enabled them to benefit from developing friendships in each of the countries visited. 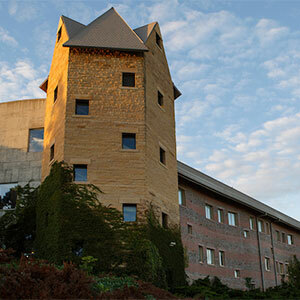 The touring program has benefited significantly from relationships with UNO’s International Studies and Programs (IS&P). This internationally acclaimed program has helped to make many of the arrangements and contacts through its some thirty sister universities throughout the world. This relationship has given students and faculty the means to connect with their counterparts and in many instances develop lasting friendships. Each individual who travels with the delegation is treated beyond being just another American tourist, they become very special guests in the countries in which they are visiting as well as ambassadors representing UNO, Omaha, the state of Nebraska and the United States of America. Another significant enhancement of the UNO International Music Touring Program is its partnership with the Omaha Sister Cities Association (OSCA). Omaha shares sister city relationships with Braunschweig, Germany; Shizuoka, Japan; Siauliai, Lithuania; Naas, Ireland; and, Xalapa, Mexico. 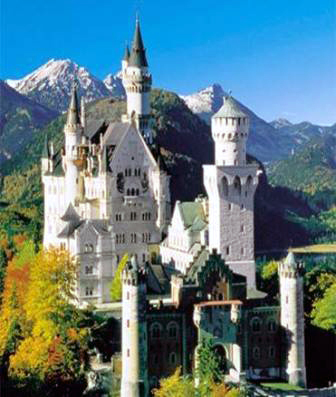 OSCA and its local affiliates have further enriched the touring program through their numerous connections in each of these cities. 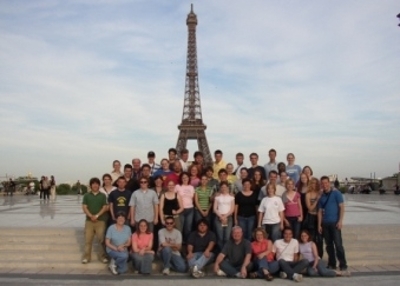 The organization has been invaluable in helping to provide one-in-a-lifetime experiences as the music groups travel abroad. 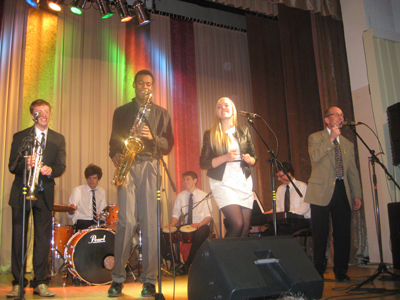 In May of 2013 The UNO Jazz Combo led by Dr. Pete Madsen became the third UNO jazz group to tour the Baltic States. The delegation from UNO included Senior Vice Chancellor BJ Reed, Dean of International Studies and Programs Tom Gouttierre, Director of International Programs Merry Ellen Turner, Director of the School of Public Administration Ethel Williams, and Theater Professor D. Scott Glasser. Arriving in Riga, Latvia, the group was greeted by friends from Siauliai, Lithuania and Riga. 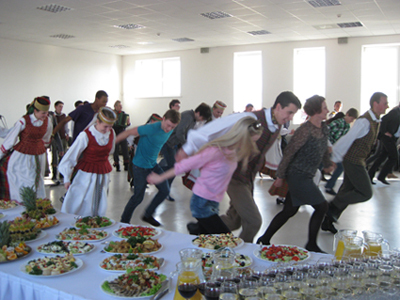 The group was immediately whisked away to a welcome reception at Siauliai University (SU) featuring a tasting of Lithuanian cuisine and entertainment by "Saule"-the university's folk ensemble featuring Lithuanian instruments, folk songs, dances, and traditional costumes. The next day was dedicated to a celebration of the 15th anniversary of the sister university relationship between UNO and SU. In addition to a formal ceremony highlighting the dozens of exchanges that have occurred over the past 15 years there was a gala concert featuring the UNO Jazz Combo, Saule, SU's Studium Mixed Chorus and Pavasaris Women's Chorus, and the folk-rock ensemble Kitava. UNO students joined forces with SU students on several numbers including Route 66, Senor Blues, and Amigos Para Siempre. It was here that our group picked up our featured singer for the duration of the tour: SU student Agne who quickly became an honorary member of the UNO Jazz Combo. 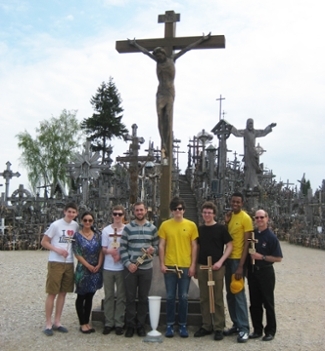 The following morning the group visited the famous Hill of Crosses outside Siauliai on the way to a day of sightseeing in Riga, Latvia. The day concluded with a performance at a Riga jazz club that quickly evolved into a jam session with some of Riga's best jazz musicians. The traditional UNO vs. SU basketball game took place the next morning with the traditional outcome of the Lithuanians emerging victorious. Both sides had a great time and enjoyed interacting in a casual environment of good sportsmanship and fun athletic competition. The afternoon featured a concert in the Siauliai amphitheater with other ensembles from throughout Europe including our friends from Riga in an excellent concert band performance conducted by Janis Purins of the Latvian Academy of Music. In the evening our hosts treated us to a dance performance by the professional Russian group "Todes" at Siauliai Arena. The next two days were spent on the Baltic seaside at the national park on the Curonian Spit with performances in the beautiful resort towns of Juodkrante and Nida. In addition to enjoying the stunning scenery, our delegation was treated to a yacht ride on the Baltic hosted by the mayor of Nida. The week concluded with a performance at the beautiful Siauliai Cathedral with Pavasaris Women's Chorus. After the concert our hosts provided a farewell party at Kurtuvenai Regional Park complete with delicious food and drink, horseback rides, and hours of Lithuanian folk dances and polkas! UNO students made many friends with Lithuanian students throughout the week and there were many tears shed and good will gifts exchanged during the farewells.